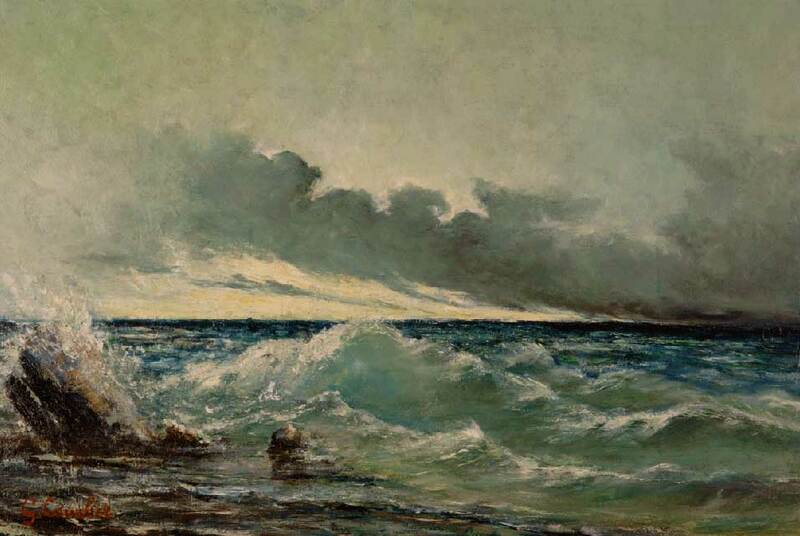 Gustave Courbet, La vague, oil on canvas. SOUTHAMPTON.- Southampton City Art Gallery presents a major exhibition for summer 2010, Sea Fever: From Turner to Today includes over 80 works by some of Britain s best known artists. It will draw on highlights from the gallerys permanent collection including Turners recently conserved Fisherman upon a Lee Shore in Squally Weather and Christopher Nevinsons Loading Timber at Southampton Docks as well as a large number of loans from public and private collections including Barbara Hepworths Sea Form (Porthmeor), Maggi Hamblings recent painting, Erosion and Julian Opies We swam in the Sea. The exhibition will demonstrate artists fascination with the sea and how the subject has been interpreted in art within a historical context. A relevant exhibition for Southampton , it examines our relationship with the sea, from work and leisure to times of contemplation. It will look at the pull the sea has had on many artists over the centuries and the intrigue and magic surrounding it. This includes traditional paintings representing sailing, to dramatic images of storms and rough waters, to the contemplative, calmer, romantic impression. Further highlights include Bill Fontanas Wave phases at Chesil Beach, a sound recording which will echo through the main hall of the gallery; Dalziel and Scullions film Another Place, a film taken of members of their community filmed against the north-east coast of Scotland, Hiroshi Sugimotos Ligurian Sea and Richard Deacons work UW84DC #1 from his 2001 series of lyrical sculptures. The exhibition is aimed at audiences of all ages, and there will be an accompanying exhibition guide and family trail available. This exhibition has been curated by Helen Waters and Alice Workman. Alice Workman is Lead Exhibitions Officer at Southampton City Council. Helen Waters works for the Alan Cristea Gallery, London . She is a former curator of the New Art Centre, Roche Court; National Museum Wales and ArtSway. She is a trustee of The Roche Court Educational Trust and has previously been a selector for COLLECT, the Jerwood Sculpture Prize and the Bryan Robertson Prize. Included artists: Maxwell Ashby Armfield, Edward Bawden, John Bellany, John Selby Bigge, David Bomberg, Muirhead Bone, Stephen Bone, Eugene Louis Boudin, Gary Breeze , Henry Marvell Carr, Vija Celmins, John Constable, Jean-Baptiste-Camille Corot, Gustave Courbet, Andrew Cross , Charles Ernest Cundall, Dalziel & Scullion, Philip James de Loutherbourg, Richard Deacon, Paul Delvaux, Jan Dibbets, A K Dolven, Richard Eurich, Mary Feddon, Bill Fontana, Peter Frie, Charles Ginner, Keith Grant, Spencer Gore, Anthony Gross, Derek Guthrie, Maggi Hambling, Ian Hamilton Finlay, Edwin Hayes, Barbara Hepworth, Eric Hesketh Hubbard, Augustus John, James Dickson Innes, William Adolphus Knell, Peter Lanyon, Edward Lear, Richard Long, L.S. Lowry, Ian McDonald, Eric Meadus, Margaret Mellis, George Morland, Sydney Mortimer Laurence, Christopher Nevinson, William Nicholson, Julian Opie, Vicken Parsons, John Piper, Jean-Francois Rafelli, Boo Ritson, Paul Schütze, Terry Setch, Bob and Roberta Smith, Sam Smith, Philip Wilson Steer, Alfred Stevens, Emma Stibbon, Hiroshi Sugimoto, James Tissot, J.M.W. Turner, Alfred Wallis, John Wells, Ethelbert White, Paul Winstanley, Jack B. Yeats. How Many Lightbulbs Does it Take to Change a Painting? Gavin Brown's enterprise Restages Jonathan Horowitz's "Go Vegan!"